On Saturday, I dragged my family downtown to the expo at the Westin after a lunch/play outing to the University Village. The expo was small, but got the job done: packet pickup was easy, there were vendors and good samples including some from Barefoot Bubbly (nice having a bit of vino after a hectic morning with the kids) and Nuun (good re-hydrating after a few alcoholic samples). 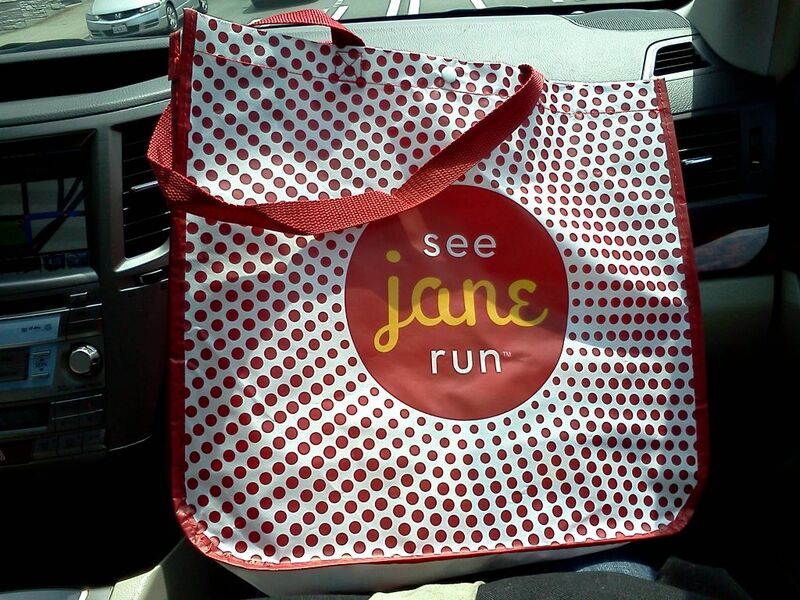 Our shirts/goodies came in really cute tote bags, and I'll definitely re-use mine at the pool or beach this summer. 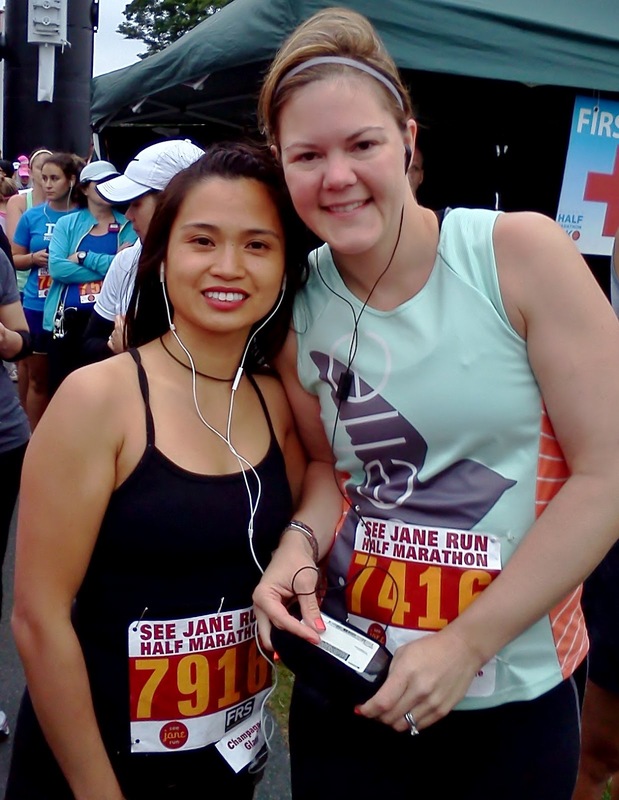 Pre-race I learned via Twitter that I'd be running with fastie teammate Amanda from the East coast who was in town visiting. It didn't take me long to spot her and have a nice chat before doing a last minute bathroom break and the aforementioned 80s warm up, which was pretty hilarious - especially watching the few dudes in attendance doing 'jazz hands.' 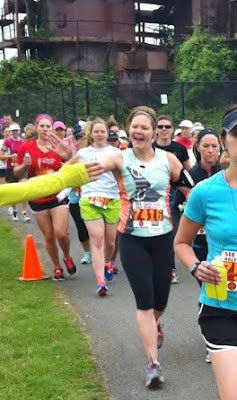 And I am an idiot and forgot to grab a Oiselle team pic! bah! Plus, she had to run over to Safeco for a game afterwards. Ah well, hopefully there'll be another meet up in our future. BTW, her finish time? 1:36:46. Daaaang. I also spotted Lauren at the Nuun tent to say hello and Super Runner Mom, who's one of those folks I totally identify with via her blog and Twitter, and got to chat her up for a few minutes beforehand. Before I knew it, it was time to line up. I looked over and right next to me was my hairdresser! So funny. I saw her just a week or so ago and we ended up talking about running and realized we'd both be at this event. I didn't know if I'd spot her because she's a TINY little thing. But there she was, and I snapped a quick pic with her. And apparently not only does she do great hair, she does some great running: clocking in at 1:47:08! Now, I normally love out and backs in a race; the first one along the course was super fun, seeing familiar faces, giving cheers and just general people watching. But by this point we had passed Gas Works Park (aka: the finish line) for a last hella long out and back and mile 11 seemed like an eternity. 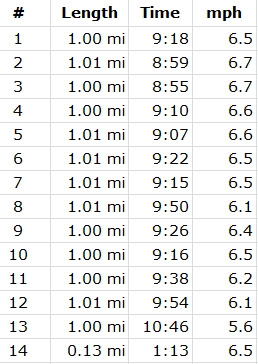 First off, I was counting on a second GU and for the life of me didn't see any at mile 10 - but I was preeeetty out of it. Second, the signage seemed weird for mile 11, like it was out too far and it messed me up mentally. Teammate Amanda said that according to the signage in the last 3 miles, she ran a 7:20 mile (probably right), a 9:36 and then a 5:44 mile... Errr.. Third, I had run out of water and it seemed like more than two miles without an aid station - but, again, I was kinda losing it mentally at this point. So, yeah, all of that amounted to MAJOR LEG CRAMPS. That's a new one. I've had aches and strains of all types, but never a cramp while running. There was a bit of an achilles thing when I was training for the Seattle Half Marathon and I had platar fasciitis when I was in college. But for the most part, my issues are my hips and hamstrings. Compression socks? Eh, I've never seen the point. I need compression shorts/capris. Well I wish like hell I had some compression socks or calf sleeves on. Might have helped the feeling of knives being stuck in my calves and that awful seizing up/squeezing sensation that gave me no other choice than to limp. The last time I felt that kind of pain was in swim practice and we'd have to do sets with flippers; every single time I would use those stupid things I'd get a leg/toe cramp and have to jump out and stretch by the side of the pool. I did NOT want to have to jump to the side and stop in this scenario. So I walked. A lot. And it made me mad and sad. But, I also didn't want to ignore the very loud and angry signals my body was sending me and injure myself or, as I said, have to stop completely. 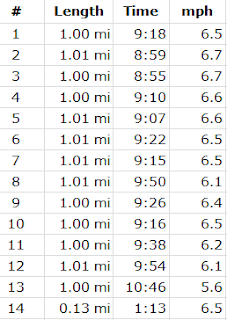 So mile 11 and 12 were jog/walks that were nearing 10 minute miles and mile 13 was nearly an 11 minute mile. I kicked it up at the end where there was a huge finishing chute and tons of crowd support, but man, I bet those pics will be more fodder for Uglyracepics because I was very obviously wincing in pain. However, there's a silver lining, as there always should be - just gotta look for it. When I saw the clock and factored in the staggered start, I thought the time would be close to my last half. And, lo, I was only about a minute and 10 seconds short of a PR. Final time 2:04:05. Crazy. And, of course, as much as I was thinking "never again" in those last three miles... I really want to chase that sub 2 hour goal. I was secretly hoping it might happen this time around, but deep down I kinda knew better with the lack of consistent training for this race. Hope springs eternal, though. I'll chalk this up to being my 'best bad race' - kind of like giving the 'best bad massages.' And if you don't understand that reference, I CANNOT HELP YOU; STOP MAKING ME FEEL OLD. And to end on an even better note, the post race festivities were some of the best I've experienced. There was plenty of water, bananas, Luna bars galore (I think I lifted at least 5...), bagels, pretzels, a cute photo booth, lots of tables and chairs to hang out at, and the best part: a commemorative champagne glass filled with chocolates and then as much sparkling wine as you could put away. There was a sectioned off area for the plus 21 crowd and free flowing libations from Barefoot Bubbly that were rather tasty. I only had one glass, though, and chatted with some fellow runners before getting too chilly (the wind and cold is good for running, not for standing around drenched in sweat) and I needed to go stretch in the worst way. I'm not entirely sure I'll do this half next year, only because of the time of year. If the weather had been at all like what we've experienced in the first week or so of July (sunny and highs in the 80s) I would have been even worse off. I think my goal races are best saved for chilly rainy days, and it's a good thing that we have plenty of those around here. 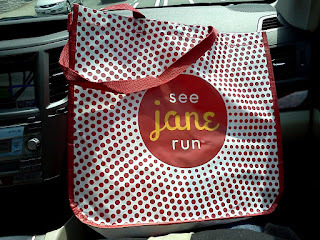 BUT, I would so love to do the 5K next year and drag friends along to do a little girl bonding/drinking. Overall it's an excellent event and a great half for a normal person who likes warm air and sunshine. The last 3 miles were terrible, I felt like the out and back was never going to end. The still had Gu when I went through so I bet you were just out of it. 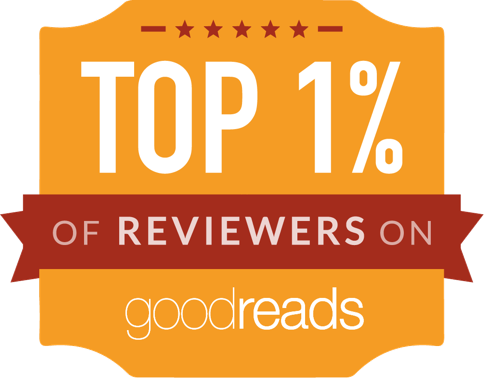 Great job overall. Need a PR course check out the Snohomish Run, just got info on it in my email today - super flat and looks like a fast out and back. Great recap! It was so nice to meet you and see you on the course - you looked great, by the way - never would have guessed that you were having a hard time then. My foot cramped up for the last few miles of my marathon and it was crazy - I feel your pain. I ran the race last year and that last out and back really did a number on me mentally. I knew it was coming this year, but it still got me, and I walked a bit after mile 12 (12! I was almost there, and I walked?!). I totally agree with you on the weather - we really got lucky. P.S. I would kill for your finish time. Great job! Ugh, I know, that was the hardest part about walking - I was SO CLOSE, I felt like I should have just been able run through the pain. But that didn't seem like a good idea... And that's totally the kind of random thing that I worry about if I ever decide to do a full. ps- um, you're time was like, what? 3 minutes different than mine?? you could totally do one in 2:04, or less than 2:00 FO SHO. Love the recap, you look great in the singlet! I am jealous of getting high fives from the Oiselle ladies! It was so good to see you out on the course! That last out-and-back was killer. You should chase the sub 2-hour!! I KNOW you can do it. I didn't really think I could do it until the beginning of May this year. What a great post! I totally could feel that pain with you! !